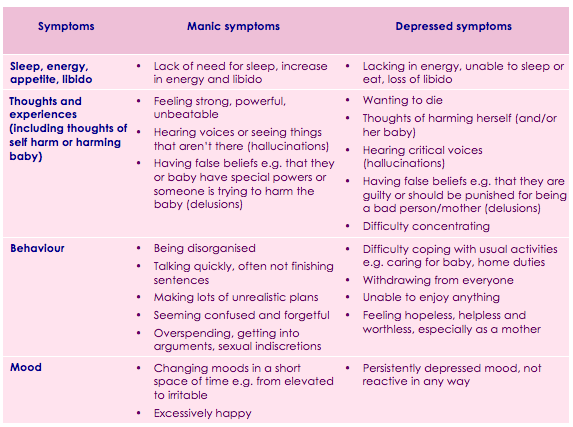 Puerperal psychosis is characterised by marked changes in mood, thoughts, perceptions and behaviours. Symptoms of puerperal psychosis can be extremely distressing for the woman experiencing them and for her family, and they affect the mother’s ability to care for her infant properly. Many women experience manic symptoms and may be inattentive towards the baby due to agitation and an inability to focus. For some women, this manic phase is followed by a severe depression where the woman is unable to function and may be at risk of harming herself and/or her baby.